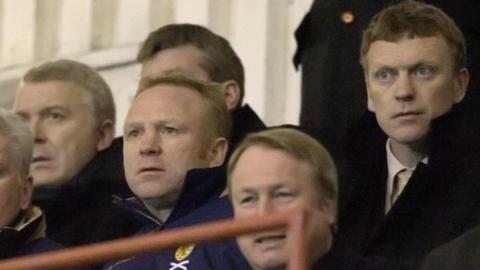 Former Scotland coach Alex McLeish believes taking on a title-winning team is what eventually cost David Moyes his job at Manchester United. McLeish insists if Moyes' predecessor Sir Alex Ferguson's final tilt at the Premier League crown had fallen short, Moyes would have enjoyed more leeway. "Nobody can see a project through in that amount of time," McLeish said. "I guess the difference was he came in on the back of a team winning the Premier League." McLeish, who played under Ferguson at Aberdeen, cited the revival of Liverpool as a reason for sticking with Moyes, with United's great rivals on the cusp of winning a first title in 24 years. That would come at the end of Brendan Rodgers' second season in charge at Anfield - an opportunity that Moyes will now not have at Old Trafford. "In that league last season, Manchester City underachieved and Liverpool were starting to rebuild under Brendan," said McLeish. "You see the fruits of that this year with Liverpool riding high at the top of the Premier League. "It's amazing. You give Brendan a bit of time and he's done what he's done. Moyesy will feel he could have done that but we'll never know. "They [Manchester United] had already shown that they were a successful team and it would have been different if he had had to come in and build it again." McLeish managed in England's top flight, first with Birmingham City and then in an ill-fated spell in charge of their city rivals, Aston Villa. And he knows how Moyes will be feeling after the axe fell on his short but turbulent tenure. "He'll be absolutely devastated because he'd have wanted to get to the summer," McLeish added. "I'm absolutely convinced he couldn't wait to get to the end of the season and start afresh. Perhaps he'll feel gutted that he never ever got that opportunity. "I would like to think he'd have had a better chance with picking his own players. People are saying he made a mistake with [Marouane] Fellaini, who hasn't really shown that he can be a Manchester United player as yet. "And David would certainly have wanted to atone in terms of bringing fresh quality into the club."